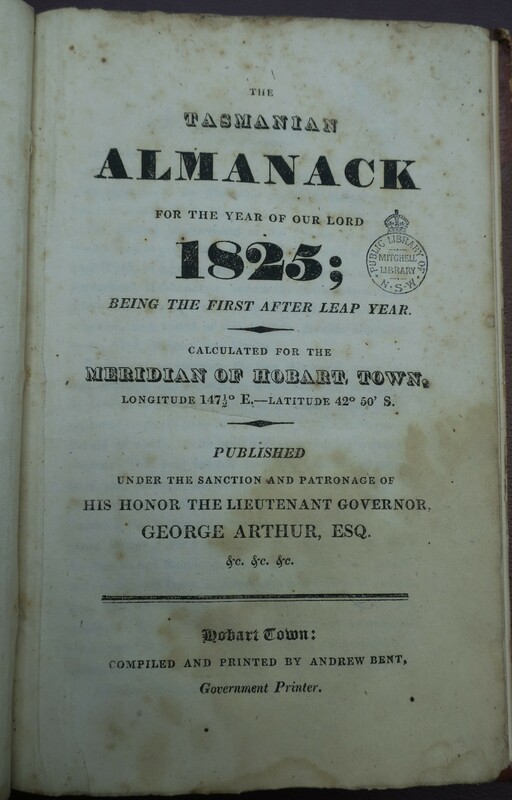 The Tasmanian Almanack for the Year of our Lord 1825; being the first after Leap Year. Calculated for the Meridian of Hobart Town, Longitude 147½° E.—Latitude 42° 50’ S. Published under the Sanction and Patronage of his Honor the Lieutenant Governor, George Arthur, Esq. &c. &c. &c. Hobart Town: Compiled and printed by Andrew Bent, Government Printer. 88 p., post 8vo in fours (Wilson) pages 18.7 x 12 cm. approx. Folding engraved plate of signals facing p. 65. A variety of original covers have survived – blue, yellow or pink paper with cream back strip (paper sometimes stiffened), and an unusual contemporary tall binding in Wilson Collection. Ferguson 1047. Copies: Alexander Turnbull Library, National Library of New Zealand; Allport; ANL; ANL (FC); BL (cannot currently locate); Crowther; DC; ML (2 copies); NSL; Tas Parl (2 copies); TSL; TU (2 copies); Wilson collection (2 copies). Published 1 Jan. 1825, price one dollar. The signal plate, engraved by Thomas Bock, was the first book illustration published in Tasmania. Includes what is probably the first directory of Hobart Town. Includes on p. 8 some ‘original stanzas’ on New Years’ Morn, probably written by E. H. Thomas. One of the TU copies is inscribed on flyleaf: John Faulkner Jnr Jany 31-25. The Gift of Andrew Bent at Hobart Town. J Gresley 1833. John Smith of Launceston was summoned to answer the complaint of Edward Lord. Signed by Chief Justice J. L. Pedder. 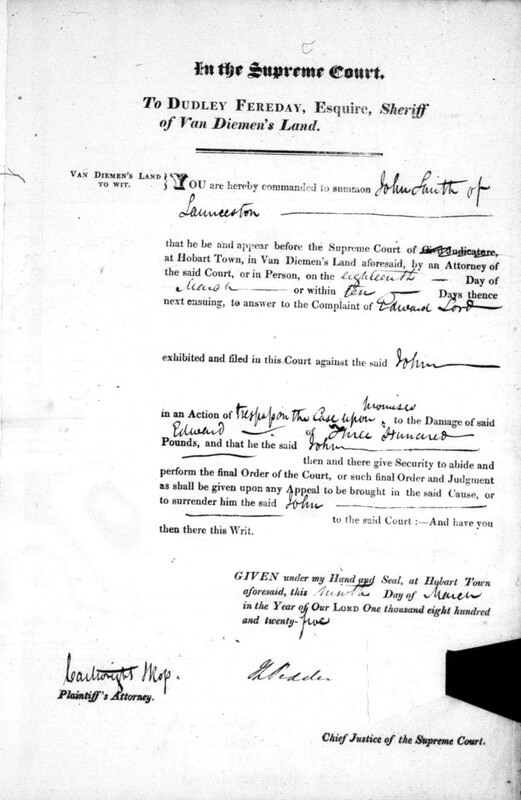 The Supreme Court opened on 10 May 1824 and this summons was signed on 9 Mar. 1825. Broadside, 40.5 x 50 cm. Copies: TAHO (NS52/1/41); Wilson collection. Bent had advertised enfeoffment forms for sale as early as 1822. This example was printed between Oct. 1824, when Bent received some elegant new types, and 10 May 1825 when it was signed. This masterly piece of work shows Bent at his peak as a practical printer. Another example in TAHO was used in Oct. 1826, for the sale of a property belonging to Bent’s good friend Bartholomew Broughton. 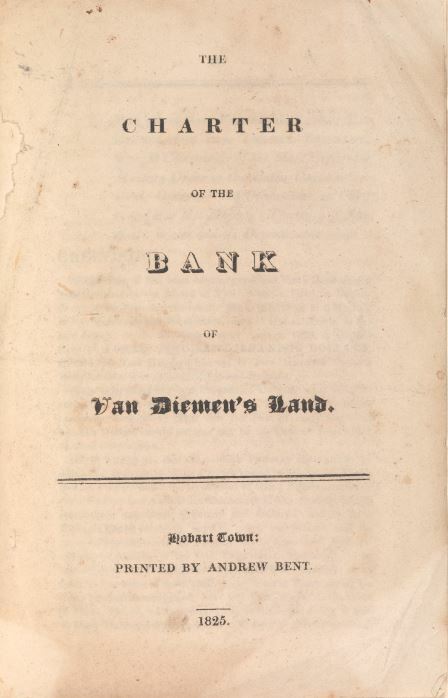 The Charter of the Bank of Van Diemen’s Land. Hobart Town: Printed by Andrew Bent. 1825. 20p. (3-19 (verso blank), last leaf blank), 20.5 x 13.3. cm. Plain blue paper wrappers. Moves to form a joint stock company bank began with a public meeting on 11 Aug. 1823. Bent was one of the 73 original shareholders listed in the Bank’s Charter. 200 shares were issued, at 200 Spanish dollars each. 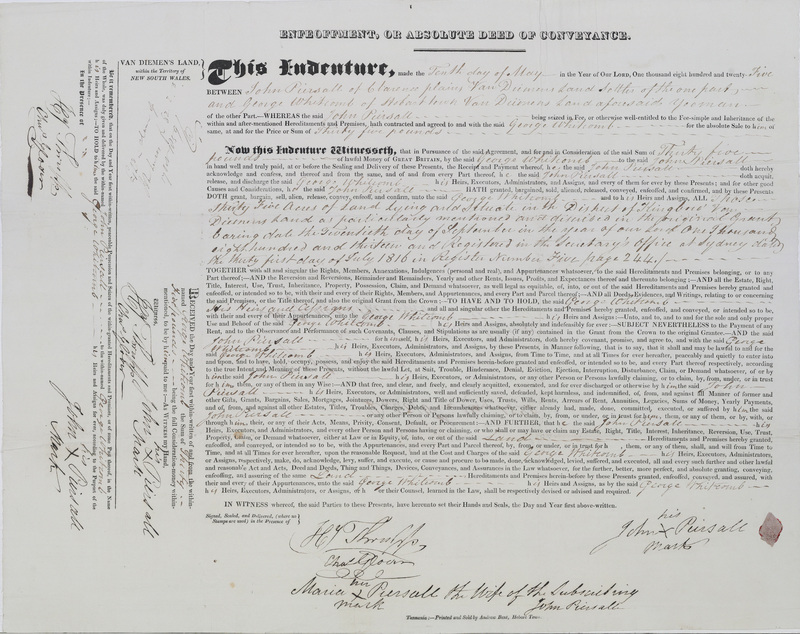 HTG of 27 Feb. 1824 noted that the charter of incorporation had been forwarded per Woodlark from the Governor in Chief and that the notes of the Bank were ready to be put into circulation immediately. HTG 11 Feb. 1825 announced that the charter ‘is at length printed.’ Bent’s 1825 Almanack indicates that he was the letter press printer for the Bank, and W. [i.e. William] King was the copper plate printer. A receipt for an installment on purchase of a share in the bank is shown in 1823 imprints. 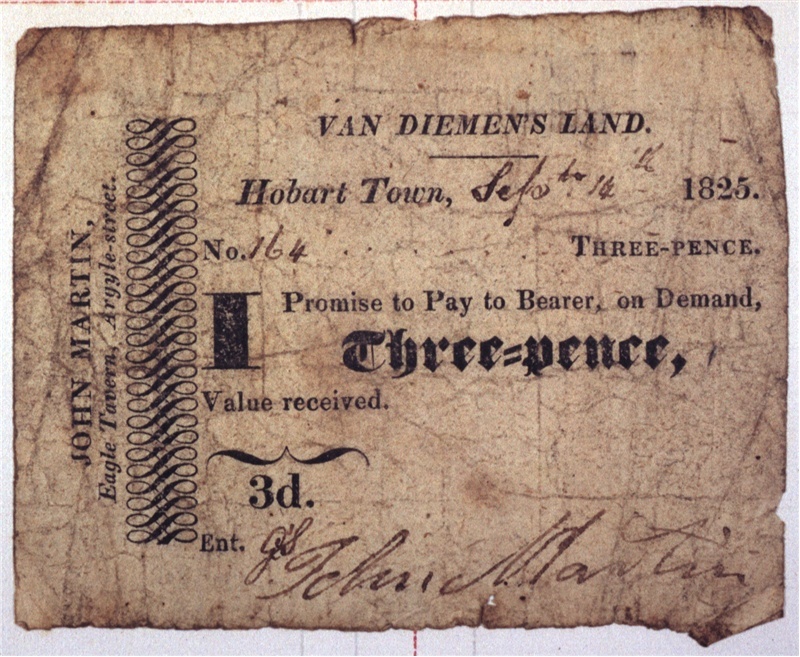 Three-pence [promissory note] issued by John Martin, Eagle Tavern, Argyle Street. In: Tasmanian paper currency [album] collected by Dr. William Edward Crowther. 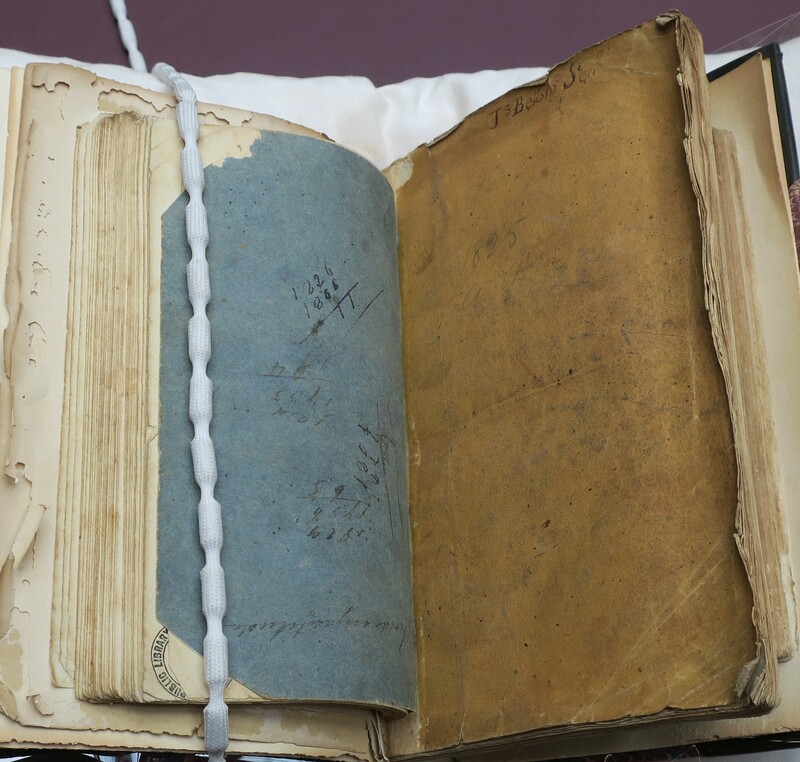 Digitised by Libraries Tasmania.